The color is Sherwin Williams Solaria. D's favorite color for the past year (at least!) has been yellow. He wanted a yellow bedroom, so we compromised with the bathroom and his closet. We wanted a cheerful yellow, not gold or neon. It also needed to be bright enough for this bathroom, which has no natural light, and yet not be washed out in the bathroom downstairs, which is full of natural light. We really like how it turned out. On the other wall, we have the vanity and linen closet. The granite is Venetian Gold. We weren't planning to put granite in the bathrooms, but the beauty of using remnants is that our cost ended up being less than the solid surface we had planned to use. The floor was an adventure. Originally, we put down Konecto Exotic Woods Bamboo >Luxury Vinyl Tile planks, in Caramel. But apparently we got a bum batch because it started peeling up within weeks. Our vendor was wonderful and quickly replaced it with a very similar looking LVT. Our new floor, shown below, is Armstrong's Natural Creations Arbor Art Strip Bamboo in Caramel. The one thing we did overly well in our house is plan for storage. In our old house, we had one linen closet for the entire home. In this house, we have linen closets in all three full bathrooms, plus a large linen closet in the upstairs hallways. Plus, all the bathrooms have plenty of drawers in the vanities. I have no idea how we'll fill this space up, but when you're planning to live somewhere for the rest of your life, it's better to plan for more space than too little. In the linen closet in this bathroom, we attached a simple full-length mirror on the inside. We used command strips to hold it up. (We did the same thing in our mudroom closet). We opted for a full mirror in here to take advantage of the long vanity and to make the room look bigger. We bought the light fixture at Menards. We bought the clock from Target. I ordered the custom "You are loved" vinyl from Uppercase Living before our house was even done. I knew I wanted D to see this daily reminder, no matter what else he saw in the mirror. I picked up the yellow flowers at a yard sale when we were staging our old house. D liked them so much, I put them in his bathroom. Of course, being a Dutch family, they should be tulips, but I love daisies, so they'll do. (Now that I look at it though, I think I might paint the container blue). I bought the red airplane at Hobby Lobby for his vintage transportation themed room, but it keeps ending up here. I made this dry erase board with cute transportation letters using a red frame I found at a thrift store for $1.50. You can read how I did it here. I also made the art on the main wall, based on a photo I saw on Pinterest. I dusted off my PowerPoint skills and made my own. Even though we knew we were "one and done," we thought it would be a good idea to put a door between the vanity area and bathroom for when guests stay. We were already thinking that we wanted to host at least one exchange student, and especially for a girl, it made sense to provide the extra privacy. Originally, I hung a fabric shower curtain, but our little mess maker keep soaking it during bathtime. It's now in his room as part of his book nook. We bought this one at Meijer (not shown online). Because D still spends quality time in the bathroom each day, we made this little book shelf for him. 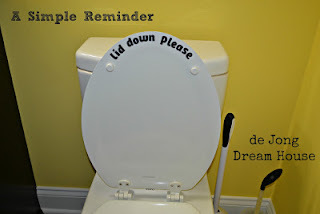 Since the dual flush toilet is new to some of our guest, I labeled them for appropriate use. Sweet D says, "1 is for pee-pees. 2 is for poopies. 3 is for tootsies. 4 is for books." Now you know. Lastly, we made a row of preschooler sized robe hooks on the towel bar since D doesn't use regular towels yet.